Ahhh…what a life. Swimming in a serene pond. Gobbling up dragonflies and frogs. And waiting to become a dragon… Wait, what?! I have no idea, but apparently that’s what Koi dream about. 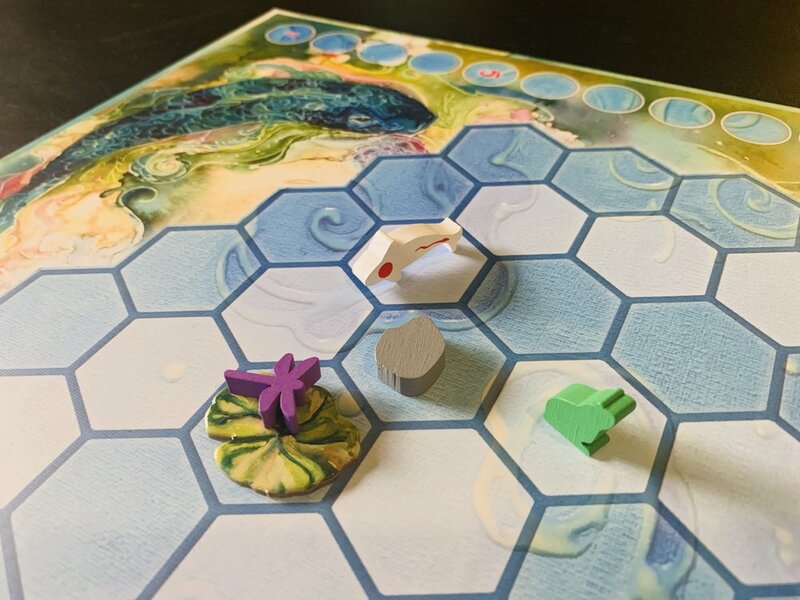 We’ll explore all of that in today’s review: Koi, from Smirk and Laughter Games. So is Koi a zen experience, or is it getting flushed down the toilet in a hasty funeral? Let’s find out! Place the board on the table, with the correct side up for the number of players. Place the Lily Pad and Rock tokens on the board, according to the setup diagram in the rules. Place one Dragonfly on each Lily Pad. Determine the starting player and give that person the Starting Player token. Each player takes a set of two matching Koi. One goes near the score track, and the other you hold onto until your first turn, when you’ll place it in the board. You’ll deal Koi cards to each player, depending on the number of players. Then shuffle the Weather cards and deal out six in a line—the rest can go back to the box. 1) Reveal the next Weather card and apply it’s effects for that Day only—they’re not cumulative. 2) Spawn Dragonflies on all empty Lily Pads—except Pads adjacent to Frogs, which don’t spawn new ones. 3) Deal three Koi cards to each player. You skip these three steps for the first Day only. 4) Starting with the First Player, each person takes their turn. You can do the A and B actions as many times as you want or can, based on the number of cards you have. a) Play a Koi card and resolve it. b) Discard two or more Koi cards from your hand to the discard pile, and then draw that number of cards minus 1 from the draw pile. c) End your turn, discarding down to 5 cards. 5) Check for a Flood, which is triggered if there are no Dragonflies on the board at the end of someone’s turn. 6) Move to the next player. 7) Once everyone has gone, the Day ends. 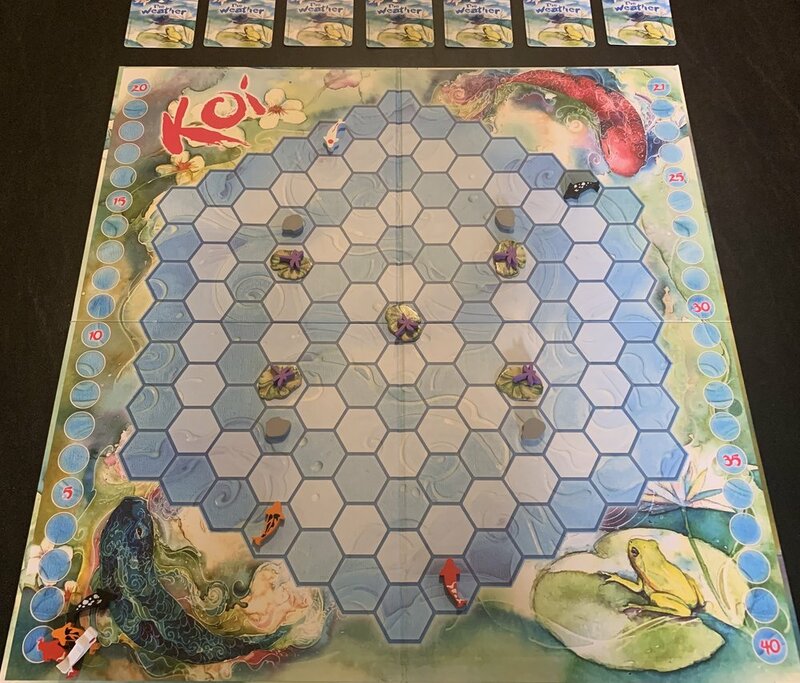 Each player totals his or her score for the Day, records it with their Score Koi, and then returns accumulated Draginflies and Frogs to the supply. 8) Pass the First Player token to the person with the lowest score—ties go to the lowest score clockwise from the token’s current position. 9) Begin a new Day, and at the end of the 7th Day, the game is over. The Koi cards come in two types. 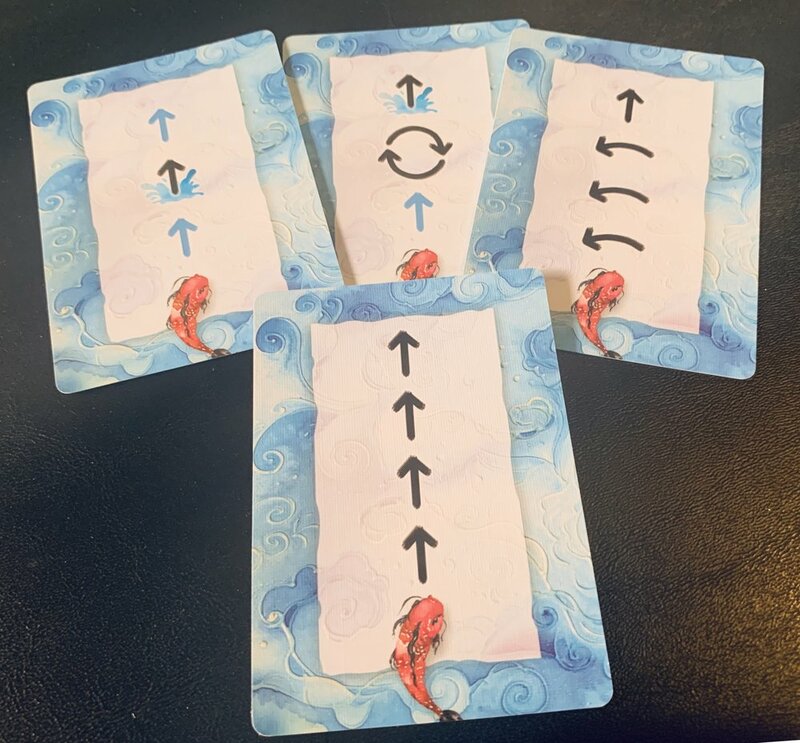 The movement cards move your Koi around the board. They have various arrows on them, and you read them from the bottom up. You must do each of the directions in black type, while directions in blue type are optional. The arrows might move your Koi forward, or turn it, turn it around to face any direction, or even jump over a hex to the one behind it. The idea is to move in such a way as to pass over Dragonflies or Frogs, which you’ll eat. Other cards have “natural beauty” on them, and let you place a token on the board. Rocks block movement and are never moved once placed. Lily Pads will spawn Dragonflies, and might move around based on Weather cards. Frogs eat any adjacent Dragonflies, which can in turn be eaten by your Koi. Cherry Blossoms cause adjacent tokens to move one space away—except Rocks and Lily Pads. The Flood is the last thing to explain. If, at the end of a player’s turn, there are no more Dragonflies on the board, a Flood occurs. (It can also occur due to a Weather Card.) First you remove all Cherry Blossoms and Frogs from the board—leaving any Rocks and Lily Pads. Then all Koi are pushed to the edge of the board—toward the closest edge. You can face your Koi in any direction you’d like. Lastly, you spawn Dragonflies on any empty Lily Pads. Firestone—I enjoyed Koi. It’s a nice, relaxing abstract with some opportunities for clever play, which is a big plus for me. Jeremiah—Same here. I thought, “What a peaceful, delightful looking game.” I don’t have a lot of titles that involve programming so it’s definitely a nice addition to my collection! Firestone—This game is stunningly beautiful. The artwork. The pieces—how great are those wooden Dragonflies?! It’s all well done. Firestone—True. Most games my wife will play only because the other three of us want to play. *coughLordsofWaterdeepcough* But she was perfectly willing to give this a shot. Firestone—I had a couple of smallish issues. First, I felt like there was a large advantage to going first in the turn. You pass the first person token to the person with the lowest score, but if they’re only behind by one, but get to go first, it seems like a big advantage. I’m just not sure it evens out but I’ve only played a handful of times. If it continues to be a problem, we’ll likely figure out a house rule. The other complaint is just that there are a lot of interactions that happen in the game—so many that there’s a chart in the rule book. The game isn’t complex but the fact that you have to consult a chart for your first few games was daunting for some people. Not a big deal—and certainly not after you have a game or two under your belt. Jeremiah—The game’s “weakness” is also its strength. While it can take some tinkering to program the best move/turn. When you combo up those cards and pull off a killer sequence it’s VERY satisfying! Knowing that you thwarted your opponents’ plans (stealing a tasty meal of Dragonflies from their clutches) and having a drastic effect on the landscape of the board is a lot of fun, and once you get a few rounds into the game these combo opportunities become more frequent. So if you feel like you’re off to a slow start, stick around and gather up some cards cause good times are coming soon! 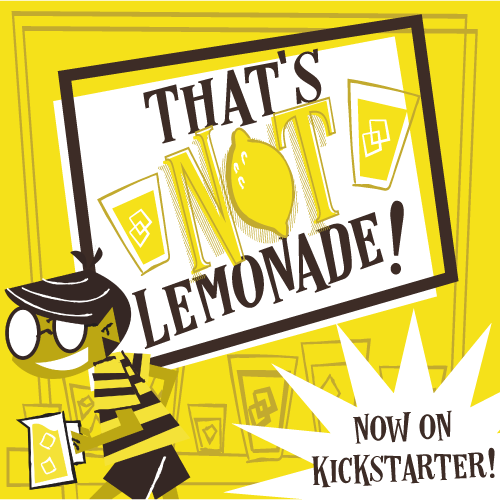 Jeremiah’s Final Verdict—Koi checks off a ton of really important boxes for me: casual gamer friendly, fun theme, engaging and interesting gameplay, amazing artwork and components and most of all a really enjoyable game. All around, I’ve had great experiences with this game on the table! Theology of Games would like to thank Smirk & Laughter for providing review copies of Koi. This in no way affected our opinions of the game.